Scallops have long been fished in the waters of Rye Bay. 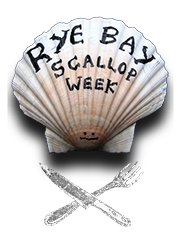 Local bye-laws restricting the fishermen to harvesting their scallop catch from 1st November until the 30th April are strictly adhered to by Rye’s fleet who use the small (under 10 metre) RX registered boats. The beds are checked regularly and allowed to regenerate when necessary. There are also size restrictions on the catch, leaving the smaller scallops in the water for future years. Checks undertaken by both DEFRA and the local fishermen ensure that stocks are healthy and sustainably maintained. “… harvesting of scallops in Sussex is one of the most stringent in terms of restrictions etc. The East Channel scallop fishery is a productive one, so that coupled with a responsible, abiding industry, should certainly pave the way to sustainability!” Quote from Sustainable Fisheries Development Officer. The Rye Bay fishermen find that 70′-80′ is the minimum depth that scallops can be found in this area which does make hand diving impractical. But with the restrictions on size, season and limited boat capacity Rye fishing industry continues to harvest annually without any noticeable reduction in stock. If you would like further information about Rye’s fishing fleet, it’s catch and it’s practices then you can call Russell Drew at Market Fisheries (Rye) on 01797 225 175.